It’s rare these days for our hero Link to embark on an adventure where he doesn’t make a companion for himself. The formula is well solidified. Soon after the quest begins Link joins forces with his companion, they work together to overthrow the villain, and then at the end, the companion leaves Link, much to his dismay. Out of the main companions to date, which has the most important role? Which is the most loved by fans? Which is the most hated? It’s easiest to start with the most hated, because quite clearly, it’s Navi. Link was pretty much the only one upset by Navi’s departure, because majority of the players definitely weren’t. I’m not sure if it’s her insults that Link’s lazy, her incessantly demanding ‘hey’ and ‘listen’, or her tedious instructions on how to open a door when I’ve played Ocarina of Time 25 times, but few people seem to like Navi. Pros include Z-targetting, cons include everything else. Navi had no significant role to play in Ocarina, and although the original companion, she’s far from the best. Majora’s Mask simply changed Navi’s name to Tatl and then gave her some personality; some attitude. Tatl receives nowhere near as much hate as Navi for some reason though, maybe it’s because she has more of a purpose, and because her character development is detrimental to the story. Tatl and Tael, in fact, are extremely more loved than Navi, but it’s definitely worth asking ourselves why. The next 3D installment, The Wind Waker, instigated a different companion. One that isn’t a fairy, and one that isn’t with Link all of the time. Despite the differences, The King of Red Lions, was a much better companion. He had an important role to play and was actually somebody, not just a random fairy. He knew what had to be done and guided Link to achieve it. He was wise, and simply cool. He helped Link to travel throughout the Great Sea, and as a matter of fact, saved Link’s life. Link would have drowned after his first Forsaken Fortress escapade if our trusty boat hadn’t come along. The King simply flogged his fairy competition as the best companion. The Minish Cap was the first handheld to have a companion, presenting itself in the form of the legendary hero’s hat. Ezlo seems to receive mixed feelings. Some people love his humor and styling, others wish he would just shut up. Like the King of Red Lions, he does have a purpose in the story, and is out to get revenge on Vaati, just like Link. While clearly more popular than the two fairies, a little green hat just can’t seem to beat a boat. We now come to Mrs. Most Popular, Midna. She has everything that players want in a companion, supposedly. Being a cool shadow creature, having attitude and humor, and even some hints of a romance with Link. These two really make a team, even better than damn Samwise and Frodo. They got the job done. Midna had a purpose in the story and was useful. She had her own little dialogue too, which was cute. Clearly Midna is the fan favorite; so maybe I’m just not a fan then! The latest installment, Phantom Hourglass, returns to the idea of the fairy companion, with Ciela and co. She’s easily the favorite of the fairies, but not much beyond that. She was once again just Navi reinvented, with the same annoying calls. At least she had a purpose to the storyline though. There was also Linebeck who, whilst not being a main companion, did help Link greatly and fight with Link until the end, and I mean that literally. 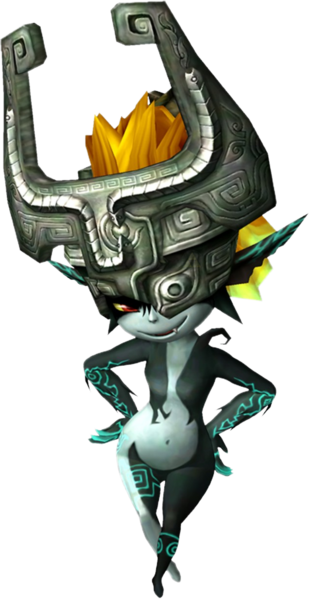 His comic release was funny and pleased fans, but neither of the possibilities from Phantom Hourglass can top the almighty Midna. She has a strongly secured position as the fans’ favorite. In perspective, what ever companion is your favorite is simply a matter of ‘whatever floats ya boat’, and The King of Red Lions is the only boat that’s floating, so I swing that way. Who knows, maybe this kickass Phantom from Spirit Tracks will be the fans’ favorite before the year is out. But until then, who’s your favorite?